On Monday, the Impossible Project (the people who rebuilt the Polaroid formula from the ground up) announced the availability of their instant film for Polaroid cameras. It won’t come cheap. Prices range from $18 to $35 a pack. They officially will be available Thursday, but Impossible is taking orders now and they’re selling quickly. Each film option gives a status bar of how many packages are sold. It’s a little hard to gather how many photos are in each pack, but the PX100 black and white film has 8 photos per pack and runs $22. $3 a photo? Kinda crazy, right? But then I visited Impossible’s gallery for this PX100 film. And I must say I’m really impressed. The tonal quality is poetic. It’s graphically contrasty, yet soft and delicate at the same time. The story behind this product really quite remarkable. The engineering involved in a paper-thin instant photo is simply awesome. Back in January, I blogged about Polaroid’s announcement that they’re bringing back their instant film. I’m not quite sure if Impossible’s film is completely independent of the film that Polaroid will be selling or if this is the actual product that Polaroid mentioned in their January announcement. 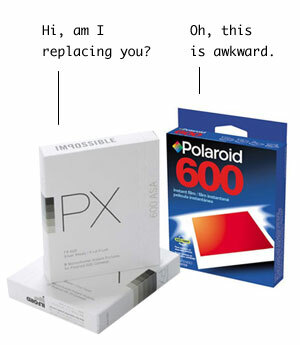 It really looks like to me that Impossible is completely independent from Polaroid proposed product. I admired Impossible’s mission the last couple years to rebuild the Polaroid formula on their own, but I’m really hoping Polaroid comes out with their own film. It’s nice to have some options. i like that “going Polo”. i read somewhere that Polaroid won’t be manufacturing any instant film. They will be leaving that up to Project Impossible to do. I’m very curious about Lady Gaga’s role as a creative director at Polaroid. I know it’s all a publicity stunt, but I’m curious how her role will impact the priority of instant film. Three bucks for a “polaroid” print? That’s crazy. Are the prints 8×10? Then it’d be worth it.